Constructions sites are notoriously risk heavy work environments. There is a great deal of heavy equipment being used, lots of hazardous debris from wood to nails to concrete and more. Often times construction workers are need to utilize various forms of ladders, outside elevating apparatuses, and various forms of scaffolding to reach the areas that must be worked on. Many tools and pieces of building equipment are electrically operated leaving room for concern about electrical hazards. 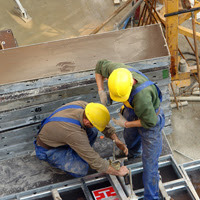 Because of the high risk factor construction workers must complete both safety training and instructional classes to gain the required understanding of the job they will be performing and how to make the work site as safe as is humanly possible. The 5 major safety concerns at construction sites tend to be as follows; falls, electrical shocks, various injuries to the body through the improper use of personal protective equipment, blood loss or infection because of cuts or gashes sustained on the job, and repetitive motion injuries. The first risk, falling, has many different incarnations on a construction site. The fall may consist of tripping over discarded debris and may cause only minimal physical harm or may consist of falling from support scaffolding, from a ladder, or from a roof. Injuries that can be sustained from falling can be as mild as slight scrapes and bruises and as dangerous breaking ones back leading to either paralyzing the individual or death. It is important to follow all relevant safety guidelines when working at elevated distances from the ground and to constantly be aware of one’s surroundings. Electrical shocks can occur for a myriad of reasons. If electrical equipment is being used it is important to follow all safety precautions attributed to said equipment and the operation of that equipment. Failure to comply with electrical guidelines can lead to severe electrical shocks which can do a great deal of damage to the human body including potential death. Electrical concerns are further serious because they can result in a fire, causing damage to the site and potentially killing others at the site. It is important to operate all electrical tools away from water. Utilization the protective gear that is given to each individual construction worker is of the utmost importance. Protective gear at construction sites generally includes hard hats, protective goggles, steel-toed boots, and heavy duty gloves. Because of the variety of work done at construction sites there is a high amount of variant debris that can be harmful if not guarded against properly. Failure to wear any of the protective gear required can lead to such health issues as concussions, brain damage, blindness broken bones, etc. Improper use of protective gear can result in severe cuts and gashes which leave the body open for extreme blood loss and infection, depending on the circumstances. Depending on what equipment is being used fingers can become detached, especially when lax safety measures are being followed. Repetitive motion injuries are not as immediately jarring as a fall or cut but they are increasingly common and can lead to an inability to perform if not properly acknowledged and treated. The muscles and tendons of the body can become weary and strained by doing the same thing day in and day out. Carpal Tunnel syndrome, the strain of the wrist, is increasingly common as are concerns about back injuries, knee injuries and should injuries. Discussing these issues with a physician before they become a problem is the best way to avoid the permanent damage that repetitive motion can do. As a company who does business at a construction site, it is your responsibility to take precautions to avoid these types of injuries. It is also prudent and wise to have plans in place in case an accident does occur, even after your safety precautions. Preparations to take care of the injured person should be the first concern. From there, properly recording and reporting the first report of injury to for the company, insurance, and government takes priority. These plans and preparations will make sure that your workers and visitors stay as safe as possible.